Are your ready to rock?? I said… ARE YOU READY TO ROCK! ACDC, U2, Deep Purple, The Rolling Stones, Black Desire, Indochina, vous aurez tout. HUSH MONEY est un groupe de reprises qui constitue un véritable répertoire rock. Des couvertures issues des plus grands standards anglo-saxons et français du genre. 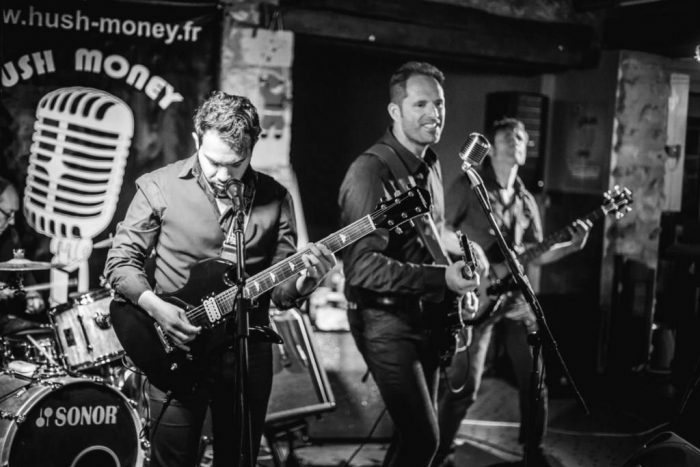 Hush Money met le feu aux planches et fait danser les foules! Are your ready to rock?? I said… ARE YOU READY TO ROCK!? ACDC, U2, Deep Purple, The Rolling Stones, Black Desire, Indochina, you will get it all. HUSH MONEY is a cover band whith a true Rock repertoire. Covers from the greatest Anglo Saxon and French standards of the genre. Hush Money sets fire to the boards and makes the crowds dance!